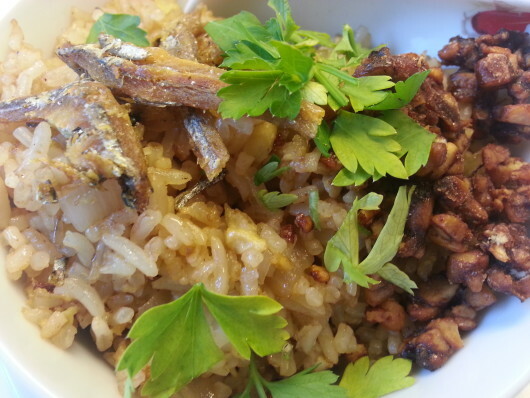 With a few ingredients it is simple to make rice with dried anchovies in a tasty lunch, a quick stir-fry and your good to go. 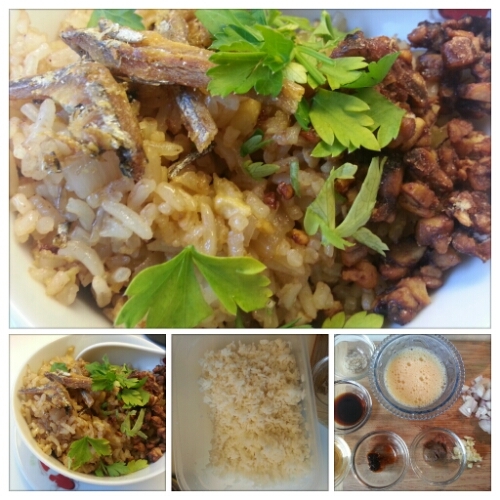 I had some leftover rice, dried anchovies and last bit of tempeh kering (Indonesian snack) to add an extra crunch to the dish. Have to make a new batch of Tempeh Kering or other dishes with tempeh, I am trying my hand to make tempeh at home. As soon as that experiment works I will post my findings accompanied with a dish. Dried anchovies are versatile in Asian cooking, they are either used for broths like in Japanese, Korean soup and stews, appetizers. In Chinese home-cooking often combined with fatty dishes as in steamed Chinese style meatloaves. Or deep-fried called Ikan billis it accompanies Nasi Lemak, coconut infused rice wrapped in banana leaves. One of many favourite Singapore/Malaysian dishes. Sambal belacan ikan billis is another one, sambal belacan is a spicy chilli paste which can be added during cooking or eaten as condiment often served with Laksa. The more talk about food and we’re wandering away from our stir-fried rice. As shown on the photo, these are all the ingredients to start the stir-fry some leftover rice, egg, shallots, garlic, shrimp sauce/paste, chilli-soy paste, soy sauce with Chinese cooking wine and a heated wok. For the photo I scattered some celery leaves on top, but it is tastier with coriander and green onions unfortunately all finished it sure was time to shop for groceries too. A quick and easy stir-fry, an assembled dish of various ingredients it has literally a bit of China, Indonesia in it you’ll find the recipe in the box below.